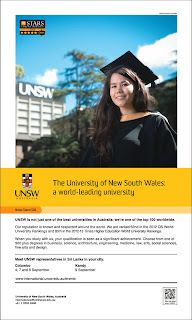 UNSW is not just one of the best universities in Australia, we’re one of the top 100 worldwide. Our reputation is known and respected around the world. We are ranked 52nd In the 2012 QS World University Rankings and 85th in the 2012-13 Times Higher Education World University Rankings. When you study with us, your qualification is seen as a significant achievement. Choose from one of 900 plus degrees in business, science, architecture, engineering, medicine, law, arts, social sciences, fine arts and design.